Pog Hall Bungalow, High House Lane, Huddersfield, Yorkshire, United Kingdom. HD7 5PL. Based in Slaithwaite in the North of England we are exactly central to all our clients in the United Kingdom. For over 20 years we have developed and refined our mobile recirculating toilet trailer designs. Our constant drive to improve our products for our clients has led the industry in customer-focused manufacturing. We're proud of our network of loyal clients stretching from Inverness to the Isle of Wight in the UK, and to the Republic of Ireland, Germany, Nigeria and South Africa. We also manufacture our own hire reserve fleet, meaning if you get double- booked we, or another member of our client hire fleet can step in to assist, to keep your clients happy and your business productive. 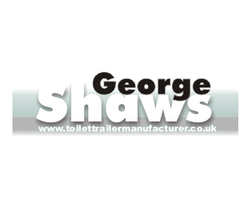 We design and build bespoke mobile toilet trailers for the UK, European Markets, and beyond. Our units are the preferred choice of some of the biggest brands in the portable toilet-hire sector, and are renowned for their durability and low depreciation. George Shaw's units are sure to meet or exceed your expectations for reliability, performance, and customer care that is second to none.